By controlling the WHAT, parents introduce foods, and should be actively monitoring how children respond. 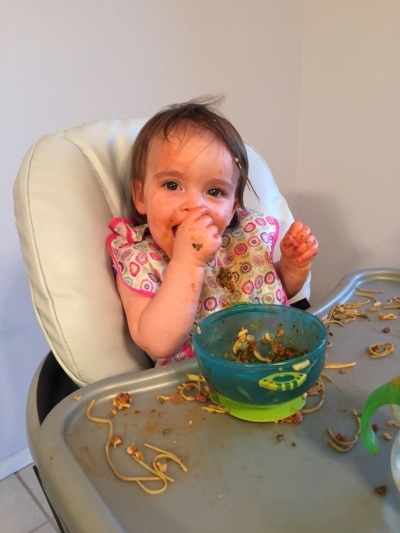 Getting started is fairly simple: you offer the food, and your child decides how much and WHETHER they want to eat it. Yep, that’s it. However, this will surely bring a challenge (and for some, the harder obstacle to overcome) to be okay with how much and whether your child accepts the food. When introducing solids to your little ones, starting small is essential to help him learn to physically accept solid food and learn to taste, chew, and swallow effectively. If you choose to start by offering purees, offer a small amount of a pureed food to your little one. If the child opens his/her mouth toward the spoon, help guide the food into his/her mouth. If the child turns away from the spoon, trust his/her instincts that he/she does not want that food or is simply not ready. 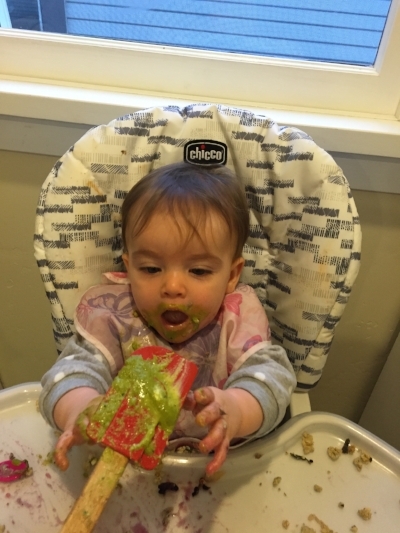 If you choose to use the baby led weaning approach, start by placing food in front of your child on his/her high chair tray or the table. Trust that your baby knows what he/she needs. And keep in mind, especially when starting out, breast milk or a breastmilk substitute will make up the majority of your little one’s calories and nutrition until he/she is close to a year old. Your job is to help them learn how to eat. You are letting them know they can choose how much and whether they would like to eat. When you move beyond purees and toward more complex foods, offered more frequently, this approach can, and often will, get more challenging. As your child gets older and enters toddlerhood less of his/her nutrition may come from breast milk or a breastmilk substitute. However, this is when it is more important than ever to keep in mind your child’s ability to self regulate. As you offer more food at a given meal, you’ll be looking for signs that your child feels hungry. That feeling (rather than a specific amount of food) helps your child to learn appropriate eating habits. Allow your child to experience the physical and cognitive effects of being hungry before eating - his/her young body’s regulatory reflexes come from feeling hungry and then knowing when he/she full. Research shows that children who are taught in this manner develop positive food attitudes, interest in eating a variety of foods, an intuitive sense of how much to eat, and long term skills for healthy eating and meal planning. There are a few things you can do to encourage your child to feel hungry and full, such as only offering a meal or snack every 2-3 hours (allow your child to feel hunger and sensation of fullness) and only offering water in between meals (rather than juice or sugary beverages). Sit and have meals with your child, as time allows, and eat the same foods as they eat. Not only will you be in a better position to monitor your baby’s preferences, but you can encourage her choices and ease her frustrations through words and sounds. When your child tries a new food or enjoys an old favorite, you can show him that his choices matter to you. Another benefit is cognitive: take the opportunity to teach your child the names of the foods he’s eating! Keep in mind it can take up to 20 exposures of a new food before a child accepts it. This is true when introducing solids to an infant as well as more complex foods to a toddler. Before you rule out a food and dismiss your child as disliking it, keep offering it. Chances are, after enough exposures, your child may have a change of heart. While some degree of pickiness is normal, if you feel concerned with your child’s feeding habits, consult your pediatrician or a registered dietitian. With the principles above, you’ll be on your way to raising a healthy eater! Stay tuned for our next post, “Age-appropriate portions”. If you’d like to keep exploring this topic with us, we’d love to see you in our next Introduction to Solids class. Rachel Rothman, MS, RD is a mom, pediatric dietitian, and instructor at the San Diego Breastfeeding Center. She lives in San Diego with her husband, Ben, and daughter, Sydney. You can contact Rachel here.